We run a Bible Study group for residents of Oakwood Court Care Home in Haywards Heath at 2pm twice a month. 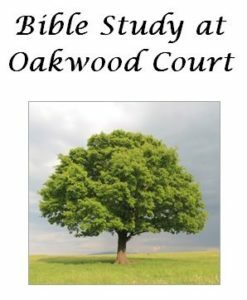 Residents are warmly invited to join the group (which meets on their own premises) to study God’s Word and reflect on what it says to us. This term we continue to study the Gospel of Luke. He was a doctor and he “carefully investigated everything from the beginning” – about Jesus. We conclude our time together with some light refreshments and good conversation. at 2pm in the Quiet Room. Easter service – Friday 12th April at 3pm in the lounge.